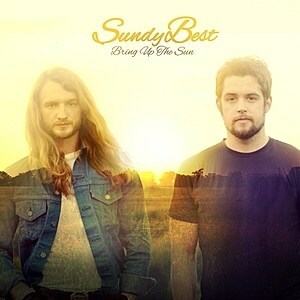 Sundy Best "Bring Up The Sun"
Lexington natives Nick Jamerson and Kris Bentley form country duo Sundy Best. The duo released their first studio album Bring Up The Sun on 10th March this year - their debut album, Door Without A Screen, was independently released in June 2012 and then re-released on 27th August 2013 once they were signed to their current label E1 Music. The album's lead single Until I Met You was released on 4th March with the video release preceding that. The track is the second on the album and starts with a strong beat from the percussion and an acoustic guitar that keeps a strong pace going throughout the track. Personally this is not my favourite track of theirs and I think there are stronger songs that could be used as the lead single but I can also see that a lot of other listeners will like this. Smoking Gun is one of my favourite tracks on the album. The stripped back opening production (the track is led by an acoustic guitar hook) means the feature is truly the duo's vocals and the relaxed reggae feel to the percussion contrasts nicely with some of the duo's rockier tracks on the album. The production as a whole is very accomplished and that combined with the vocals makes for a great track. In complete contrast to Smoking Gun production wise, Lotta Love is another one of my favourites. The vocals start straight away and then the instruments join after a few seconds. The track bridges the gap between rockier tracks such as These Days and slower tracks such as Thunder well and I can see it being a strong single for them should they choose to release it. The vocal idea of "we got a little money but we got a lotta love" is a good one to be able to build upon and the upbeat production works well with it. The highlight of the album is Thunder in my opinion. The most stripped back track instrumentally, the duo deliver an emotive, heartfelt performance and the softer production allows more of a focus on the song writing, with lyrics such as "I ain't had a hard life, just had a few hard times" and "well you came along, you sang your song, put my heartache in the ground". The track also highlights the duo's strong harmonies, something that I am sure will impress listeners but is also hidden in some of the other tracks. It is primarily the slower tracks on the album that draws me to this duo as I find their more uptempo material a little overpowering at points. These Days for instance has an overpowering percussive beat in the chorus that threatens to overpower the rest of the production and the vocals and sticks out strongly for me in a song that could be very good. Similar to this, there are various points in album opener Count On Me that feel as though too many lyrics are being crammed in (this is primarily in the chorus). It doesn't spoil the track for me but it does feel a little bit odd as it is only in certain points so seems more obvious. Whilst I wouldn't say that I absolutely love this album, I would say that there are a few really promising points and the production is very polished which promises a lot for future releases from the duo! It is also very impressive that the duo have written all fifteen tracks between them. From my point of view I just hope they don't go too rocky as their slower, softer tracks are where they really shine. The duo remind me strongly of Eric Church and Dierks Bentley and I would say this album is still worth a listen even though it didn't completely wow me as I am sure it will appeal to many listeners and as aforementioned, the slower songs are the duos real strong points in my opinion. Labels: Sundy Best "Bring Up The Sun"